I saw a commercial for the new Sharpie Pen that is supposed to not bleed through paper. 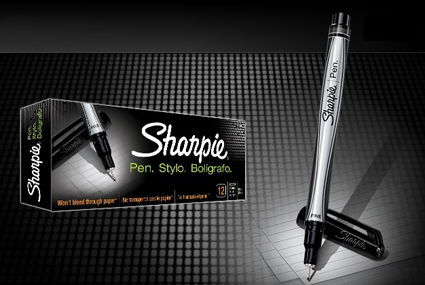 I am a Sharpie addict so I need to get one of these and try it out! Seriously, the BEST PENS EVER!!!! I picked up the 4 pack (red blue green and black) to use in my day planner but they migrated their way into my scrapbooking supplies. They are crisp, clear and acid free! You'll love them. I've been using these for about a year. LOVE THEM! I thought you had these already. Didn't you post about David Beckham signing autographs with them? I've been desperately searching for runescape money an answer to the problems I've had trying to implement this, runescape goldand I've posted bugs up to the Drupal website, but without response. Somewhere between mailhandler and notifications, the wrong info is making it into the db when a reply email is sent by a mail recipient. I love them!! No bleeding or smearing. They are the best pens. The hardest part is keeping people from borrowing them for too long! Can't wait to get the colors! I, too, am a victim of Sharpie advertising -- have you seen the adorable print ads? Target has the colorful 10-pack on sale this week for $3.99 (normally $7). I've been using a different color each time I write! I love the Sharpie pens! They're a little pricey for me, so I stock up whenever I find them on sale (right now Walmart is cheapest). If they came in brown ink, my life would be complete. I am obsessed with Sharpie pens. Thanks everyone! I got the 10 pack multi colored fine tips on sale at Target with a free Sharpie pen!